Henry Ford began production of the Model T (aka the "Tin Lizzie") in 1908, and his introduction of the moving assembly line commenced in 1913, thereby reducing the assembly time of an automobile from 12 hours to just 2.5 hours. Prices dropped to less than half the original cost and profits soared as a growing number of people were able to afford a car. 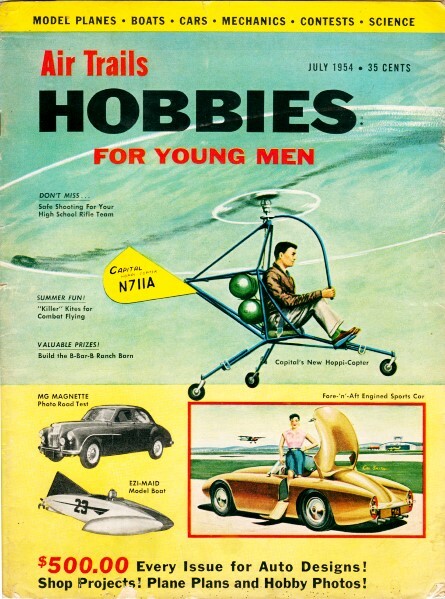 It is always interesting when reading these reports on airplanes and automobiles which were published in the middle of the last century to remember that at the time, the technology was less than 50 years old. Tonneau, BTW, is one of the French word for a barrel ('baril' being the primary word). We still speak of tonneau covers today for truck beds, but originally a tonneau was a removable set of seats in the rear of the vehicle. One of the several experimental cars hand built by Henry Ford in 1896. It had a 2-cylinder engine, chain drive and was tiller steered. Planetary gear transmission. First production Ford, the 1903 Model A, had an 8 hp engine, two-speed planetary gears with chain transmission and removable tonneau body. Without tonneau it sold for around $800. Barney Oldfield, renowned pioneer race driver, started his career on this curious 1902 Ford 999 racer having 4-cylinder engine, wire wheels. Side entrance doors first appeared on the Model B touring car which made its high-seated debut in 1905. The Model N (right) of 1906 had a 4-cylinder engine, planetary gears and shaft drive. 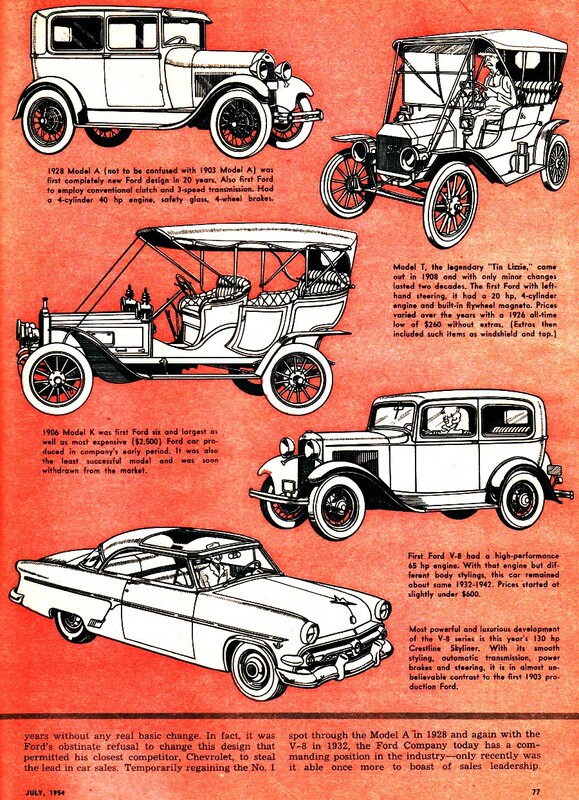 Many of its features were incorporated in famed Model T which followed it. The price was a modest $500. While it is hardly true that Henry Ford invented or built the world's first practical automobile, it can be safely said that he more than any other man brought the automobile within the reach of the masses. 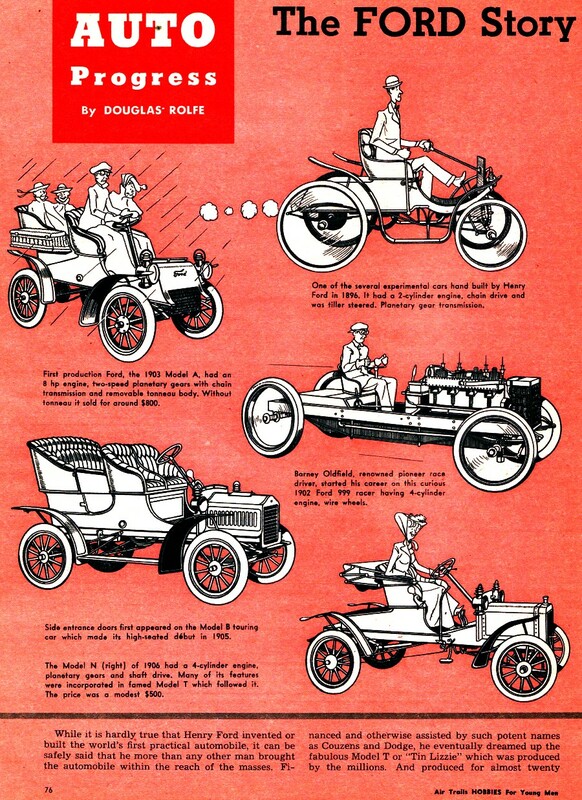 Financed and otherwise assisted by such potent names as Couzens and Dodge, he eventually dreamed up the fabulous Model T or "Tin Lizzie" which was produced by the millions. And produced for almost twenty years without any real basic change. In fact, it was Ford's obstinate refusal to change this design that permitted his closest competitor, Chevrolet, to steal the lead in car sales. Temporarily regaining the No. 1 spot through the Model A In 1928 and again with the V-8 in 1932, the Ford Company today has a commanding position in the industry - only recently was it able once more to boast of sales leadership. 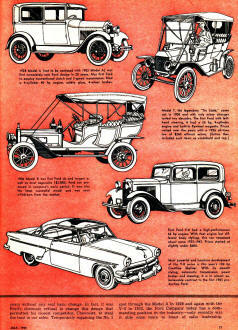 1928 Model A (not to be confused with 1903 Model A) was first completely new Ford design in 20 years. Also first Ford to employ c:onventional clutch and 3-speed transmission. 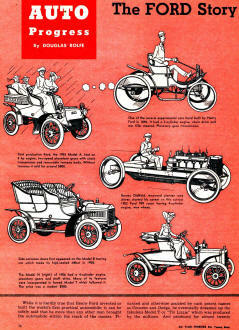 Had a 4-cylinder 40 hp engine, safety glass, 4-wheel brakes. 1906 Model K was first Ford six and largest as well as most expensive ($2,500) Ford car produced in company's early period. It was also the least successful model and was soon withdrawn from the market. First Ford V-8 had a high-performance 65 hp engine. With that engine but different body stylings, this car remained about same 1932-1942. Prices started at slightly under $600. Most powerful and luxurious development of the V-8 series is this year's 130 hp Crestline Skyliner. With its smooth styling, automatic transmission, power brakes and steering, it is in almost unbelievable contrast to the first 1903 production Ford.